New book The Fall of Wisconsin, contrasts state’s progressives with Scott Walker era. Emil Seidel was the first Socialist mayor of a major U.S. city. Photo is in the Public Domain. Wisconsin native Dan Kaufman, who now lives in New York and has written stories for the New York Times and New Yorker, has written a new book, The Fall of Wisconsin, tracing the roots of Progressivism in Wisconsin and contrasting that to the recent, conservative transformation of the state. 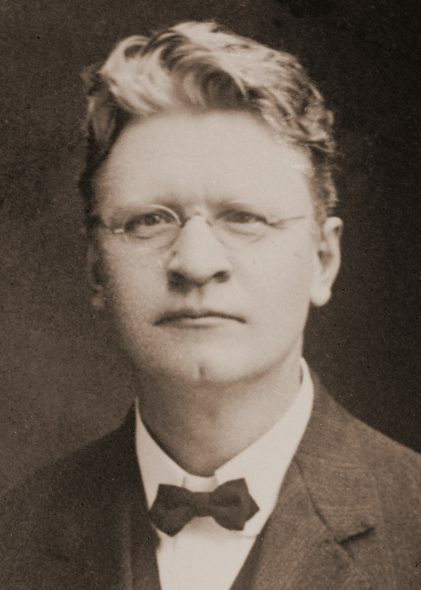 This chapter focuses on Milwaukee’s Socialists, who worked at times in tandem with Madison-based reformers like University of Wisconsin economist John R. Commons. Like the other Progressive milestones of the 1911 legislature, the passage of workers’ compensation was aided by the twelve assemblymen and two state senators who were members of the Milwaukee Socialist Party. In 1910, after a corruption scandal in Milwaukee had tarred both Republicans and Democrats, the Socialists swept into power, winning the state legislative offices, the mayoralty (which they would hold, off and on, until 1960), and a congressional seat. The party’s electoral victories in 1910 pushed the progressive Republicans to the left, prompting them to make bolder reforms to compete for voters. “The only way to beat the Socialists is ‘to beat them to it,’” Charles McCarthy wrote. Milwaukee’s Socialist Party grew out of the enormous number of German immigrants who began pouring into the city in the late 1840s. Many of those migrants were fleeing the failed 1848 revolution in Germany and had been members of the Turnverein, or Turners, a physical-fitness movement focused on gymnastics that also encouraged intellectual development and liberal, sometimes revolutionary, politics. The Turners established strongholds across the Midwest and were especially active in Milwaukee. Like many of Wisconsin’s Scandinavian farmers, they held strong antislavery views, and the movement passionately supported Abraham Lincoln’s 1860 presidential campaign. Prominent Milwaukee Turners included Carl Schurz, a ’48er who went on to become a Union Army general, a United States senator, and the secretary of the interior, and Mathilde Franziska Anneke, a journalist, socialist, and friend of Karl Marx who settled in the city in 1849 and three years later started Deutsche Frauen- Zeitung, the first feminist journal founded by a woman in America. The Turners built several centers in Milwaukee that offered gymnastics equipment as well as beer halls, meeting rooms, and auditoriums for social and cultural events. The facilities also became incubators of radical politics. In 1897, the Social-Democratic Party, the precursor to Milwaukee’s Socialist Party, was cofounded by a Romanian Jewish immigrant named Victor Berger, a brilliant tactician and organizer who developed what became called the “bundle brigade.” An army of volunteers that swelled to a thousand members, it could print flyers and pamphlets in twelve languages and deliver literature in the appropriate language to every home in Milwaukee within forty-eight hours. A woodcarver named Emil Seidel captured Milwaukee’s mayor’s office in 1910, becoming the first Socialist mayor of a major American city, while the party also won majorities on the city council and the county board. The party’s victories that year were owed largely to its reputation for being incorruptible. (“They never were approached by the lobbyists, because the lobbyists knew it was not possible to influence these men,” William Evjue, a progressive Republican legislator, once said of the Milwaukee Socialists.) Two years after Seidel’s victory, Democrats and Republicans conspired to defeat him, but in 1916 another Socialist, Daniel Hoan, won the mayor’s office and held it for the next twenty-four years. Hoan fashioned a transparent city government and won a higher minimum wage for city workers, while investing in “public enterprise”— libraries, schools, and one of the country’s most extensive park systems. While the party’s strength would never match its 1910 peak, its influence on Milwaukee, and the state as a whole, persisted. In 1924, despite a sometimes fractious alliance with La Follette’s progressives, the Milwaukee Socialist Party endorsed La Follette’s presidential bid, helping make Wisconsin the only state his Progressive Party would win. Yes, we wanted sewers in the workers’ homes; but we wanted much, oh, so very much more than sewers. We wanted our workers to have pure air; we wanted them to have sunshine; we wanted planned homes; we wanted living wages; we wanted recreation for young and old; we wanted vocational education; we wanted a chance for every human being to be strong and live a life of happiness. And, we wanted everything that was necessary to give them that: playgrounds, parks, lakes, beaches, clean creeks and rivers, swimming and wading pools, social centers, reading rooms, clean fun, music, dance, song and joy for all. That was our Milwaukee Social Democratic movement. Why did all these huge waves of German immigrants come to Milwaukee between 1880-1920. Could they not build the garden of Eden in Germany? Millions came to Milwaukee because they bankrupted their own nation. They couldn’t find work and feed their families in their socialist utopia. The Troll neglects the preceding 40 years of German immigration to Milwaukee. The German principalities were run and run down by family dynasties. Many Milwaukeeans, like me, have multiple branches of German ancestry arriving 1840-1880. They were poor, and they worked hard and raised families. And they weren’t disciples of a bigoted WASP prosperity gospel. Hey, Gary why did nirvana end. If Milwaukee was so great under socialism why did it end. Why did the Braumner building have to change its name. To much printing takes of my fuehrer. Which leads me to wonder if Hitler ran as a socialist and was backed by the communists and the Jews when did he cross the line and become a figurehead of the right. Stalin, Mao, Maduro, Castro killed millions..10..100 million yet still creatures of the left? Troll asks why Milwaukee no longer elects Socialists. The biggest reason may be the “Red Scare” after WW2 (during the rein of Joe McCarthy and the House Un-American Activities Committee). People in all walks of life were being fired unless they denounced anything that might smell of Communism. Even Cincinnati’s baseball team changed its name from “Reds” to “Redlegs” to show they weren’t Communists. Given this fear (and people’s confusion between Communism and Socialism), people simply stopped joining the Socialist Party. When Frank Zeidler (mayor from 1948–1960) decided not to run for a 4th term, there were simply no Socialists left to run in his place. Milwaukee voters didn’t reject Socialism; Socialists simply stopped running for office. Capitalism works great until you run out of other people’s money. 100 million people died between 1918-2018 under Stalinism, Lenonism, Maoism, PolPot and Castro. Kill the capitalists and the world starved death. The hammer and sickel killed more lives than Hitler. There is no utopia or Garden of Eden. Even Christ told us life is a struggle. Carry your cross. Equality kills people. Capitalists must die to have a perfect world. Troll, Communism isn’t Socialism. Communists have variously described themselves as Socialists (for example, Union of Soviet SOCIALIST Republics) or democracies/republics (like German DEMOCRATIC REPUBLIC [East Germany] or DEMOCRATIC People’s REPUBLIC of Korea [North Korea]); Communists are neither Socialist nor Democratic. The contemptible and well-named Troll displays a really remarkable depth of ignorance even for the Walker/Trump era, from not understanding that the 48ers came in 1848, not between 1880-1920, to not understanding that Hitler and his jackbooted thugs attacked and murdered Jews and communists rather than being supported by them.